The Airbus Helicopters H155 B1 (formerly the Eurocopter EC155) is a medium-lift passenger transport based on the well-known Dauphin family of helicopters. The H155 first took flight in 1997 and entered commercial use in 1999. Development began in 1996, a rapid development period which belies the H155 as a modified Dauphin. Two variants (the B and B1) quickly followed. The B1 has more powerful engines than the earlier models, improving its “hot and high” performance. B1 variants began delivery in 2002. The B1 represents the current pinnacle of Airbus’ twin-engine five-ton helicopters. Compared to the Dauphin upon which it’s based the B3 has 40% more cabin space, which was a primary reason for its existence in the first place. Twin Turbomeca/Arriel 2C2 engines power the B3 and it comes equipped with full FADEC (Full Authority Digital Engine Control) which provides fully automated single engine operation. The H155 B1 not only improves on cabin space, power and versatility compared to the Dauphin, but also against almost every other helicopter in the five-ton class. It’s spaciousness, comfortable ride, speed and endurance have made it a first choice for a wide variety of roles. Including long-haul offshore and VIP transport. The ferry range of the H155 is 985 km (612 mi) and the standard range is 857 km (463 mi). Apart from this application, the B1 has also seen service in emergency medical services, search and rescue units and special police operations. The H155 B1 is notable for its integration of many state of the art technologies. These include the five-bladed Spheriflex rotor head and Fenestron shrouded tail rotor. Both of which make the helicopter suitable for urban operations. The pilot interfaces are refined and make the H155 easy to fly under single-pilot instrument flight rules. The glass cockpit, 4-axis autopilot and advanced digital displays for ground and terrain awareness reduce the cognitive load on pilots significantly. Like the Dauphin, the H155 B1 seats 12 passengers and two pilots, albeit with more legroom. A VIP configuration for eight passengers makes a spacious helicopter even more so. About 60 customers in 28 countries have purchased H155s. Each unit costs about 10 million USD (or about 7.5 million Euro). The Eurocopter X3 is set to eventually replace the H155 B1. 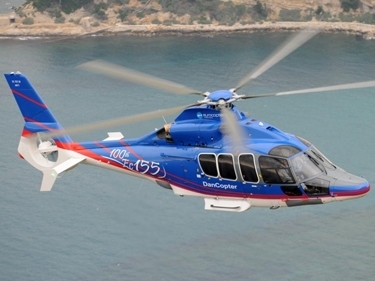 Do you want to comment the Eurocopter H155 / EC155 b1 helicopter?